ADFS 3.0 > Cannot start service MSSQL$MICROSOFT##WID on computer ‘.’. 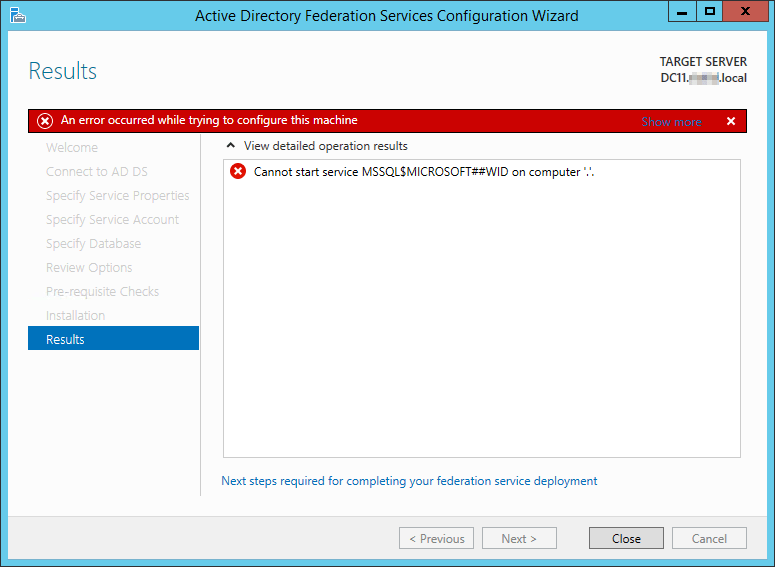 This week I had a problem installing Windows ADFS 3.0, on a Server 2012 R2 server. This server was also a Domain controller. Unfortunately there was no possibility to install ADFS on an other server. Cannot start service MSSQL$MICROSOFT##WID on computer ‘.’. Clicking on ‘Show more’ reveals no understandable error . Go into the services, and look for the Windows Internal Database. Then I received an error which showed the real problem. I tried several settings for giving ‘logon as a service’ rights to several account, but nothing worked. Assign the Log on as a service user right to NT SERVICE\ALL SERVICES in the GPO that defines the user right. Exclude the computer from the GPO that defines the user right. Start the Post deployment process all over, in the Server manager dashboard. Continue hitting F5 until the Windows Internal Database service shows up. Wait until the ADFS installation is finished. 2 comments to ADFS 3.0 > Cannot start service MSSQL$MICROSOFT##WID on computer ‘.’. Only thing that I got to work on a Windows 2016 server connected to a domain. This was installing WSUS which also uses the windows internal database which has the same permissions problem. Everything else would not work. Have been grappling with this for several days. Could you be kind enough to get this page or create a new one with the same solutions to show up with the WSUS keywords. It would help out your fellows as well as increase page views! Thank you. Bingo. Thanks for the write-up. Probably saved me a whole lot of time and frustration there.